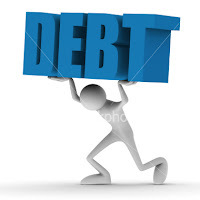 When the economy is in trouble, you may want to pay more attention to debt when evaluating a stock for investment. Companies that a carry heavy debt load may be at risk in a difficult economy. • Current Liabilities are bills that will come due in the next 12 months. These include the company’s normal operating expenses such as salaries, utilities, and so on. Long-tern debt, such as mortgages would not be included, however that portion of payments due in the next 12 months would be included. • Current Assets are marketable securities, cash and other assets that can be easily converted to cash within 12 months. Land and real estate do not fall into this category because it often takes longer than a year to sell property. The Quick Ratio is cash, marketable securities and accounts receivable divided by current liabilities (those due in the next 12 months). However, not all Current Assets are included in this ratio - excluded are accounts receivable and inventory. Basically, you are saying if all income stopped tomorrow and the company sold off its readily convertible assets, could it meet its current obligations? Like the Quick Ratio, 1.00 or better is good, and likewise you should always compare companies in the same sector. Theses two ratios, which you can find on most of the financial web site that offer quotes, tell you a great deal, about how a company may or may not weather tough times. Low numbers in these ratios should be a red flag when you are evaluating a stock.